Perhaps it is the pending arrival of yet another birthday, but recently, I've been reflecting on the age of one of my very best friends. She isn't really that old as we would normally think and it isn't like she's at Death's Door, but when I see her I can't help but to think that she is a bit grayer, a bit slower - a kind soul who has more days behind than ahead. She is and has been a good, devoted, and loyal friend who I can honestly say has never uttered a cross or irritated word to me. Over the years, she has been fully accepting of me just as I am with my all my faults and blemishes. I have been blessed with her companionship - a kindness and closeness that I don't come close to deserving. Those who read this (all two of you) may not be able to understand the treasure that I have in this friendship and how I cherish it more so as the days pass - espcially if you don't know her. I am beginning to realize and admit that I have taken my friend, somewhat, for granted. Perhaps that is one characteristic of our human nature - to only fully realize how blessed we are when we consider what our lives would be like without those closest to us. When I was unemployed (a particularly tough time for me), she was there without being asked - especially when I needed cheering. Always ready for a car ride - even long ones to pick Jessy up during her years at Mt. Vernon - she is always my joyfully enthusiastic companion. With a daily meal and a few snacks, occassionally nudging me with her head for a quick back scratch, her days seem complete. Through the years, she has demanded little and been happy just to be in my company. She isn't perfect. Her penchant for getting in the trash, and pilfering and destroying Jael's chapstick are probably her worst offenses, but they don't seem very important in the overall scheme of things. By now, you probably realize that the friend of whom I speak (type) is not technically human. 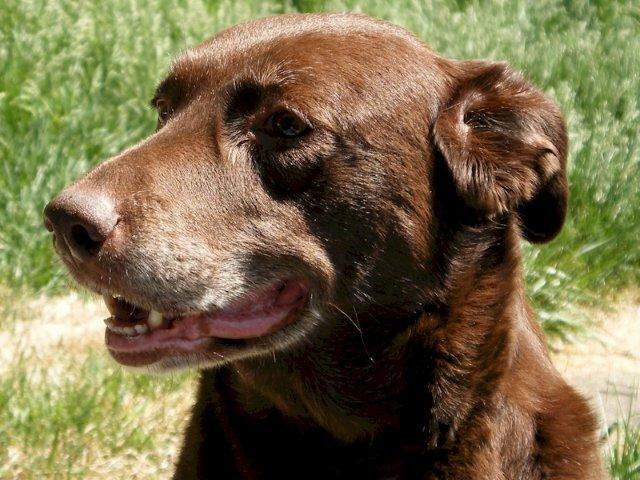 But I contend that my chocolate Lab, Penny - who will be 11 this year (November) - is one of the most giving "people" I have been blessed to know.